Easy-to-use tools, included business mail accounts, and search ad credits help you succeed. Discount applies for the initial term specified in the promotion (EXCLUDES ALL MONTHLY WEB HOSTING PLANS) after which the then current term fee will be charged. Web Hosting discount offers are open to new Small Business customers and existing customers who are purchasing a new plan. Discounts not applicable for downgrades or upgrades to existing customer plans. The discount fee offer expires on 12/31/2017. Offer is nontransferable and may not be combined with other offers and discounts, exchanged, or redeemed for cash. See the Small Business Terms of Service for additional terms and conditions. 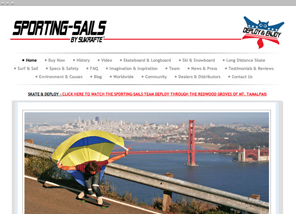 A link is included at the bottom of every page on our website. Select a 1, 3, or 5 year plan to receive a free associated domain, including renewal costs, for as long as your subscription is active. Additional domain extension options are also available at full price. Reach new customers among the 168 million unique searchers on the Yahoo Bing Network—accounting for nearly one-third of all queries in the U.S. Search Credit is valid in the U.S. Only and requires creation of separate Yahoo Bing Network account. Cannot be combined with any other offer or discount, separated, redeemed for cash, transferred, sold, or bartered. Yahoo Small Business services are intended and designed to meet the needs of personal and small business websites. This is why some of our plans offer unlimited disk-space, data transfer or email storage. It is not appropriate to use our services to support large enterprises or for levels of demand that impose undue burdens on our systems or negatively impact use by small, independently owned and operated businesses. If the bandwidth, data transfer or email storage of your website or email present a burden on the experience of other users or on our internal systems, we may, in our sole discretion, act to restrict the resources being consumed by your website, including by limiting how fast your disk space and email storage space can grow. Private Domain Registration is not available with .us or redelegated domains. 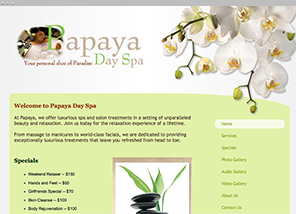 An included domain name (e.g., papayadayspa.com) with plans of 12/36/60 months. Private Domain Registration to protect your contact information (Premier plan only). 24-7 phone, email, and online support. 30-day web hosting satisfaction guarantee. The 30-Day Satisfaction Guarantee applies to new orders for Web Hosting and to existing customers who upgrade to Web Hosting from Domain only or standalone Business Mail accounts. Subject to the following limitations, you will receive a refund from of your Web Hosting fee (other than the domain registration charge), including any setup fees actually assessed, if you are not completely satisfied. Included in your Web Hosting fee may be a required yearly domain registration charge. Domain registration is arranged on your behalf with a third party following placement of your order and cannot be canceled by that third party (your domain can, however, be transferred to a new provider after 60 days). The associated domain registration charge is nonrefundable - even if you transfer to a new provider after 60 days. If the total Web Hosting fee paid by you is less than the non-refundable domain registration charge paid on your behalf, you will not be eligible for a refund under the 30-Day Satisfaction Guarantee. The Satisfaction Guarantee period starts on the date your initial order is placed. Claims for a refund of Web Hosting fees must be made within 30 calendar days of your initial order. All refund requests must be made by calling 1-866-781-9246 and must be specifically requested at time of cancellation. Refunds will be made only to the name, address, and credit card account on file. Refund does not apply to any add-on services, such as additional bandwidth, additional email addresses, or Private Domain Registration. See the Terms of Service for additional terms and conditions, available by clicking the link at the bottom of every page on our website. 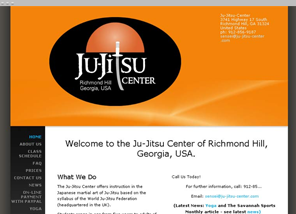 Simple site design tools make it easy to create your own website. No downloads, special software, or tech experience is necessary—everything you need is online. 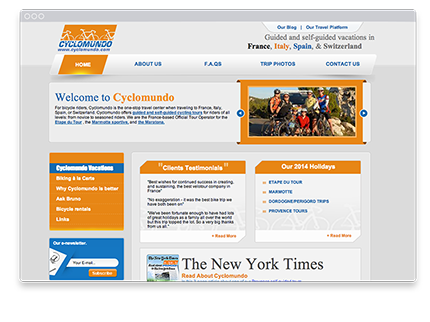 You can customize free professional designs from Web Hosting to suit your business. 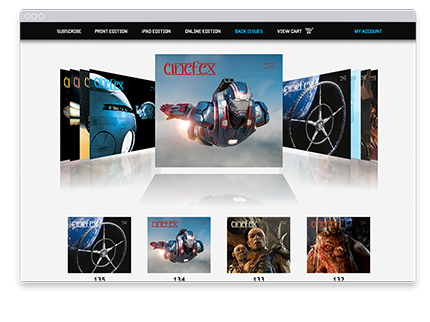 A step-by-step guide and checklist walk you through creating a site. Visitors can play or download any audio tracks you post, such as original music, readings, sermons, and more. 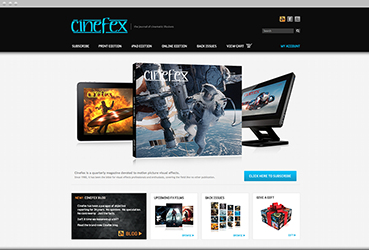 Dynamic content and other tools to engage visitors can be added to your site using Widgetbox. Google AdSense ads on your site offer a way to earn additional revenue as your site traffic grows. Use social networks like Facebook and Twitter to interact with your customers and prospects. Web Hosting sites are up and running 99.9% of the time. Based on internal monitoring. Does not include downtime for scheduled maintenance. Your website is backed up in different geographic locations so it will stay live in an emergency. Your website runs on a Unix operating system and Apache servers. Password protection is available for your accounts and sections of your website (Advanced and Premier plans only). Shared SSL certificates and encryption protect the information customers submit to your site (Advanced and Premier plans only). 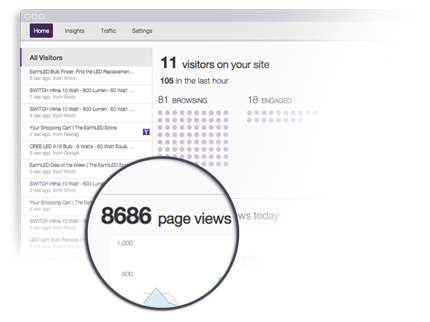 View in real-time what products customers are buying or what pages visitors are browsing. 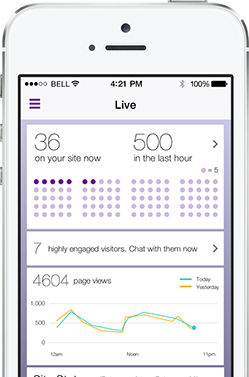 Even initiate a live chat with customers, all available free with Live Insights for the iPhone or desktop. Monitor and improve your search rankings with the help of our detailed recommendations. Discover your top keywords, top referring sites, and more at a glance with Live Insights. Track where your traffic is coming from and see which of your marketing efforts are giving you the best return on investment. Easily add Google Analytics tracking to your site to gather more actionable website and marketing metrics. These accounts must be set up separately. Submit your site to Yahoo, Google and Microsoft search engines with just a click. 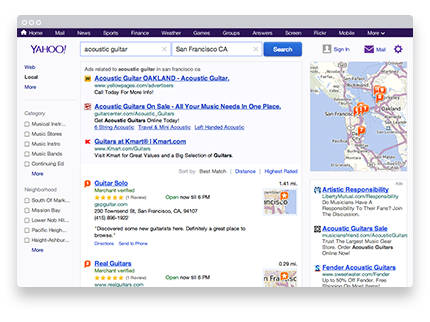 Reach customers looking for businesses in your area by listing your site in Yahoo Local. Discover dozens of ways to promote your business for low or no cost with our marketing how-to guides. Save on search-advertising compaign costs: Get a $100 credit toward the Yahoo Bing Network. Credit is valid on new accounts only. 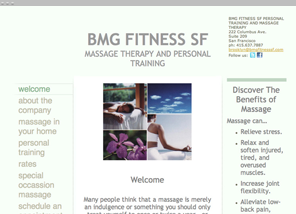 A sample of our professionally designed website templates for quickly and easily creating your own site. 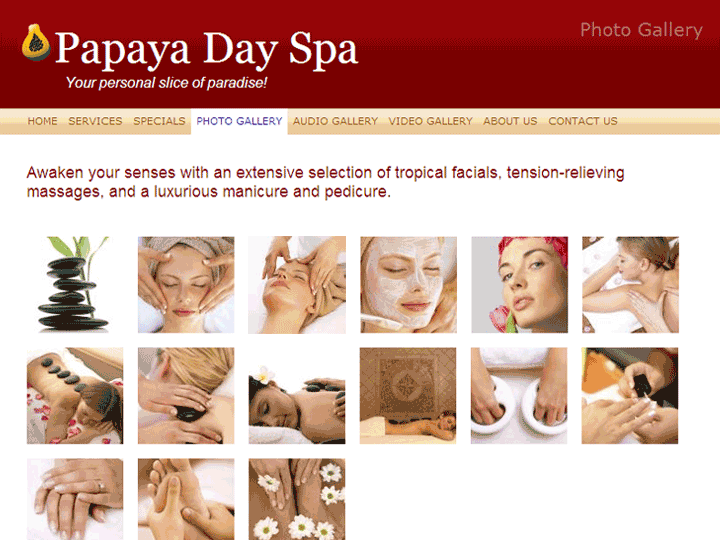 Showcase your products and services with a photo gallery. 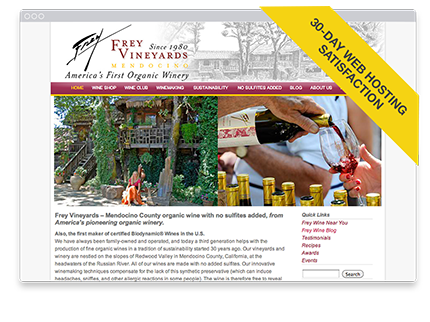 Entice visitors with video clips about your business. 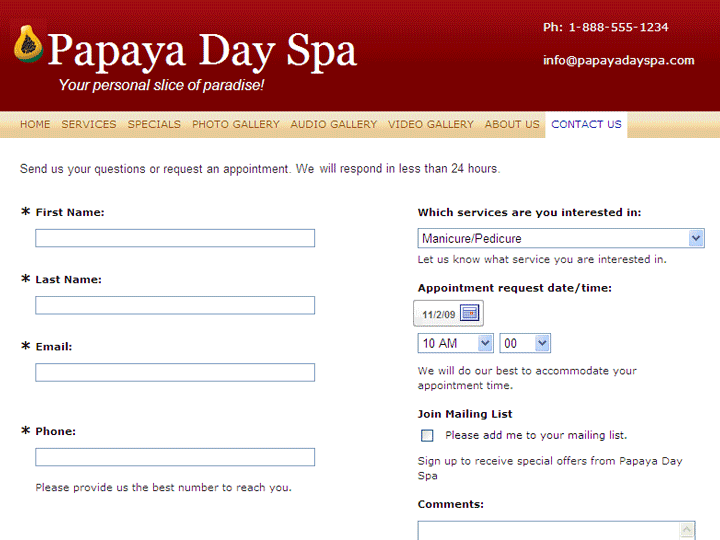 Use customizable forms to capture visitors' information. 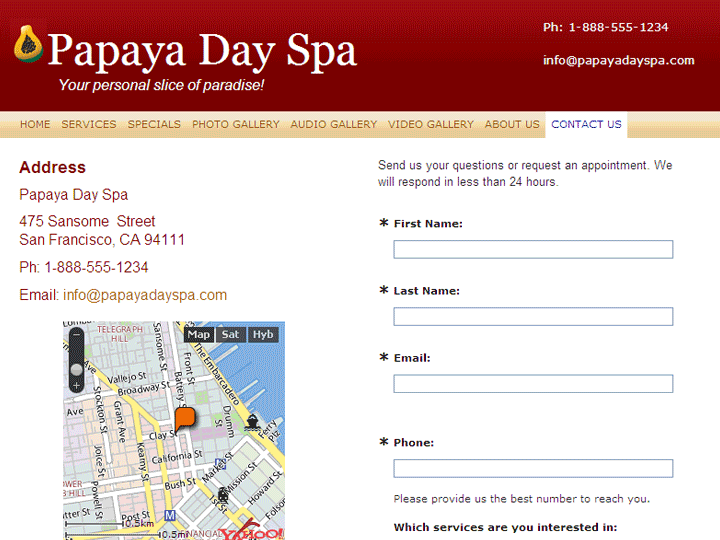 Help customers find your business location. Web Hosting Advanced and Premier plans are compatible with your favorite tools. A scripting language that advanced users can use to send information to and from a database. PHP can also be embedded easily into HTML, making it a popular choice for web developers who want to create dynamic web pages. We support PHP version 5 and hundreds of PHP functions. A scripting language that can be used to create interactive website features like calendars and guestbooks. Web Hosting supports Perl version 5.8.7, with the standard library plus 12 additional Perl modules. Give site visitors more peace of mind with the Norton Secured Seal. Displaying a trust mark from a respected, well-known organization like Symantec can make your site look more professional and encourage your visitors to share personal information and shop with confidence. 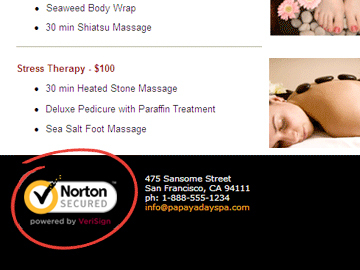 When your visitors click your Norton Secured Seal, they'll see information validating that you are who you say you are. Knowing more about you can boost their trust in your business -- helping you turn visitors into customers. What do "unlimited disk space, data transfer, and email storage" mean? It's pretty straightforward: Customers who use Web Hosting can obtain unlimited disk space, data transfer, and email storage if they use their services consistently with the Terms of Service and these paragraphs. Web Hosting is designed to serve the web hosting needs of small, independently owned and operated businesses in the United States. It is not appropriate to use our services to support large enterprises or internationally based businesses with a sustained demand that places undue burden on our systems or negatively impacts use by small, independently owned and operated businesses. Web Hosting is a shared web hosting service, which means that a number of customers' websites and other email or storage services are hosted from the same server. Yahoo Small Business uses abuse controls to help ensure that use of our services does not adversely affect the performance of our system or other customers' sites. It is not appropriate to use an account primarily as an online storage space or for archiving electronic files. If you use your services consistently with the Terms of Service and these paragraphs, your site can grow as large as necessary to meet your small business needs, but to ensure a great experience for all, we will place some constraints on how fast you can grow. The vast majority of our customers' sites grow at rates well within our rules, but our abuse controls may cause a brief delay while we evaluate if expansion is appropriate. You do not have to worry about hitting a storage limit if you use our services consistently with the Terms of Service and these paragraphs. Yahoo Small Business will increase your space along with your appropriate small business needs, but our abuse controls may impact the rate of growth or your folder size, and there may be a short delay while we assess your usage. In some cases, creating additional folders or subfolders will help ensure that the system works well for everyone. The 30-Day Satisfaction Guarantee applies to new orders for Web Hosting and to existing Small Business customers who upgrade to Web Hosting from eligible products. Subject to the following limitations, you will receive a refund from of your Web Hosting fee, including any setup fees actually assessed, if you are not completely satisfied. Included in your Web Hosting fee is a required $7.00 per year domain registration fee. This domain registration fee is paid by on your behalf to a third party following placement of your order, cannot be canceled by , and is nonrefundable, however, arrangements can be made to transfer your domain name to a new provider after 60 days. If the total Web Hosting fee paid by you is less than the $7.00 per year non-refundable domain registration fee, you will not receive a refund on orders cancelled under the 30-Day Satisfaction Guarantee. The Satisfaction Guarantee starts on the date your initial order is placed. Claims for a refund of Web Hosting fees must be made within 30 calendar days of your initial order. All refund requests must be made by calling 866-800-8092 (select option 6) and must be specifically requested at time of cancellation. Refunds will be made only to the name, address, and credit card account on file. Refund does not apply to any add-on services, such as additional bandwidth, additional email addresses, or Private Domain Registration. Other restrictions may apply. See the Small Business Consolidated Terms of Service when you sign up. Tell everyone your site is open for business. 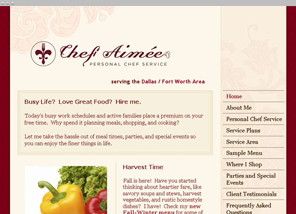 Send details about your new website to friends, family, and customers. 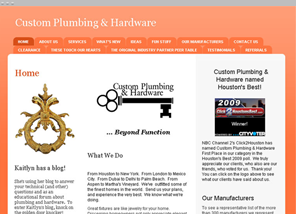 Drive customers to your home page with a prominent link. Include an optional coupon as an additional incentive. Enjoy convenient, flexible email features.